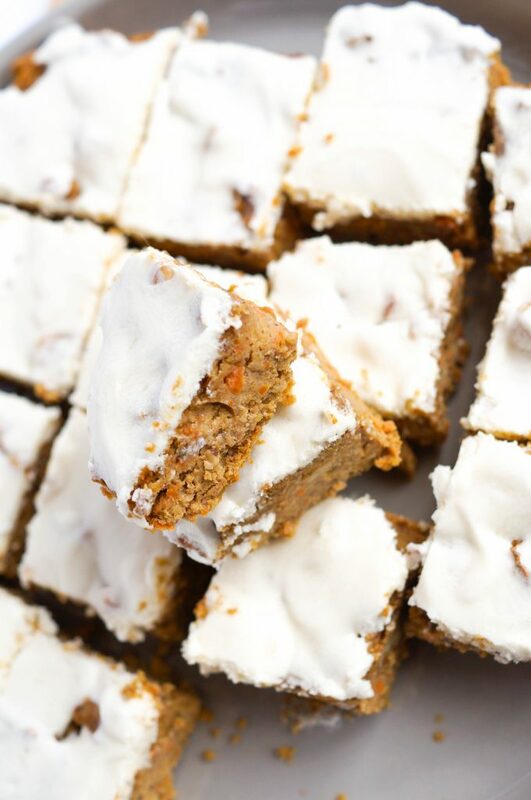 I’m semi-back from my mini hiatus while moving and just in time to share an Easter recipe for my Vegan Grain Free Carrot Cake Blondies with you all! 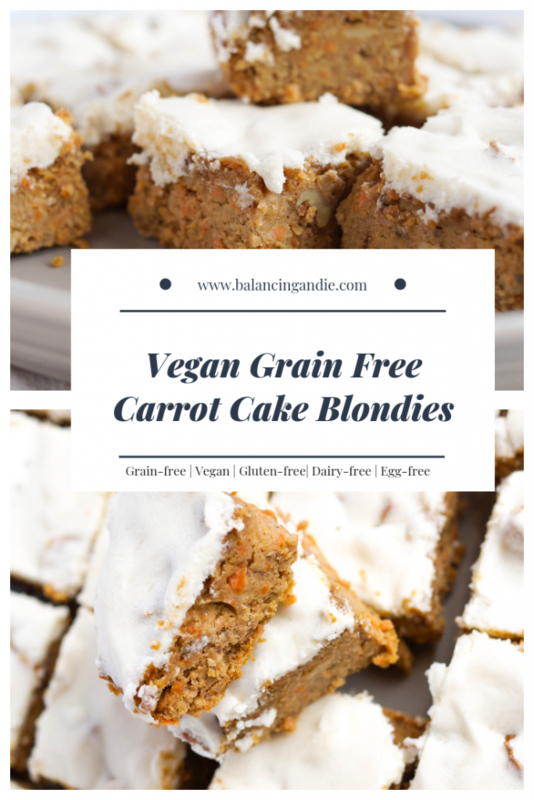 I adapted them from my recipe for Vegan Grain Free Chickpea Blondies, which were a big hit with a lot of you! 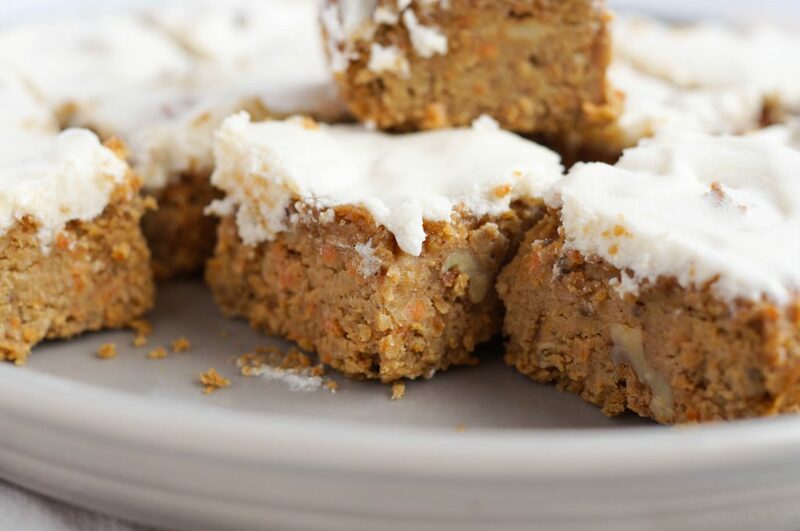 I love how easy this recipe is and how my food processor does the majority of the work! Plus, extra protein from chickpeas in baking – hell yes! You guys know I’m a huge fan of sneaking extra nutrition in when I can. I rarely put icing on anything so these were just NEXT LEVEL! However, just a note about the icing. I couldn’t find dairy-free icing at my local store that I felt like trying so I just decided to make my own using vegan butter (I used Earth Balance) and icing sugar. You can always just grab a tub of your favourite cream cheese or vanilla icing if you don’t feel like making it yourself. P.s. if you decide to make mine and are a strict vegan, please make sure the icing sugar you use is processed in a way that makes it vegan as many are not. So Hoppy Easter to you all…get it, hoppy ;)? We will doing a mini trip to Seattle to enjoy a weekend getaway so make this, share with your friends and family & don’t forget to tag me when you try the recipe! I love seeing you enjoy my recipes. Mix all blondie ingredients (except walnuts) in a food processor until well combined. Add in walnuts, if using and taste. Mixture should be thick. Adjust sweetness if needed. Bake for 40-45 minutes or until toothpick comes out clean. Allow to cool for 15 minutes before removing from pan. Allow to cool completely. Meanwhile for the icing, in a medium sized bowl, whip vegan butter and icing sugar until completely combined and fluffy. (Use beaters or a whisk for approximately 5 minutes). Stir in almond milk and vanilla extract. 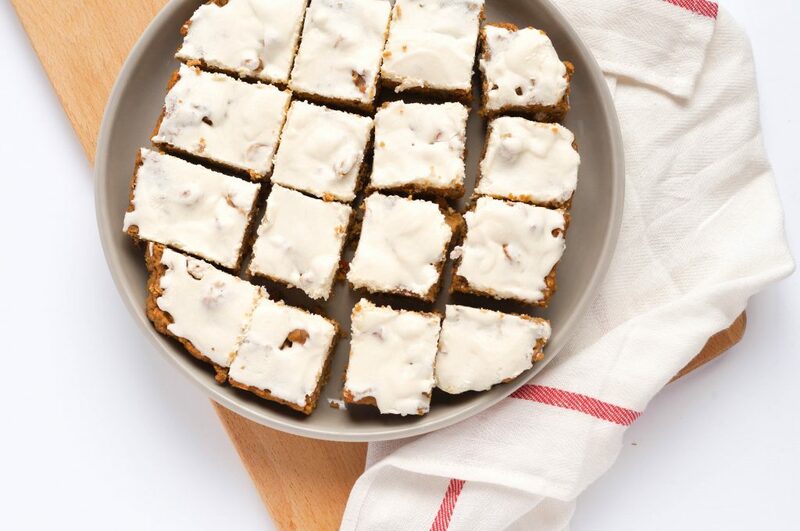 Refrigerate icing until blondies are completely cool and ready to be iced. Once blondies are cool, evenly spread the icing and return to refrigerator to set prior to cutting. Enjoy within 1 week! I used canned chickpeas & they worked perfectly. If you're looking for a truly grain free recipe, ensure that your baking powder doesn't have corn starch. Mine doesn't - I use Baker's Supply House Organic Baking Powder. Just a note about icing sugar, it's not always vegan so make sure to double check the brand you use.